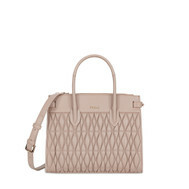 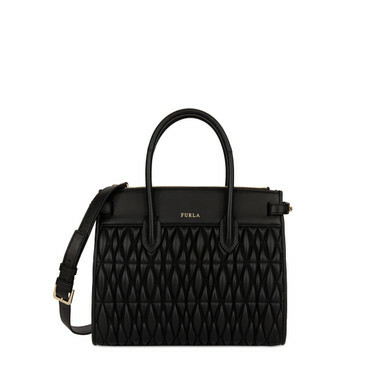 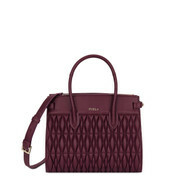 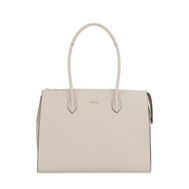 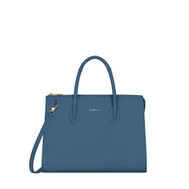 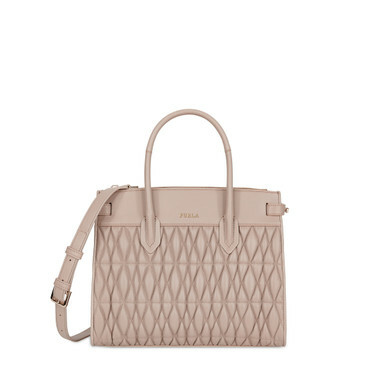 The Furla Pin Tote in quilted leather has a medium capacity and an horizontal shape. It can be worn as a shoulder bag or as a handbag and comes with three inner compartments, the central of which zipped, and inner pockets, one of which zipped. 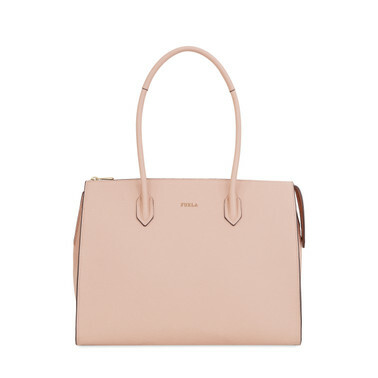 The compact Furla Pin satchel bag in textured leather is fitted twin handles and a shoulder strap in leather to allow for its usage as a handbag and a shoulder bag. Characterized by its trapeze shape and contrasting-coloured piping, this women's bag features two interior pockets, one of which is zipped. This leather bag boasts a zip closure and frontal lettering in gold-tone metal. Metal feet protect the bottom of this bag from wear and tear. The spacious Furla Pin satchel bag in grainy leather is fitted with twin handles in leather to allos for its usage as handbag. 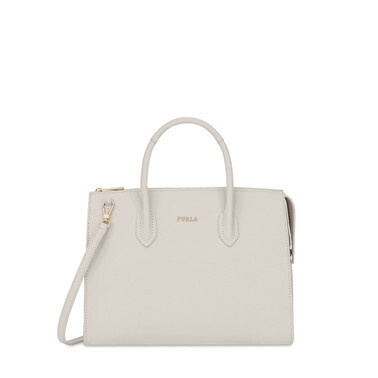 Three pockets inside this women's bag are available on the inside, one of which is zipped. This leather bag boasts a zip closure and a lettering in gold-tone metal in front. 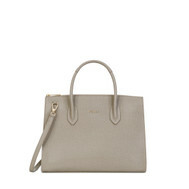 The spacious Furla Pin satchel in grained leather has two handles and comes with three inner pockets, one of which zipped. 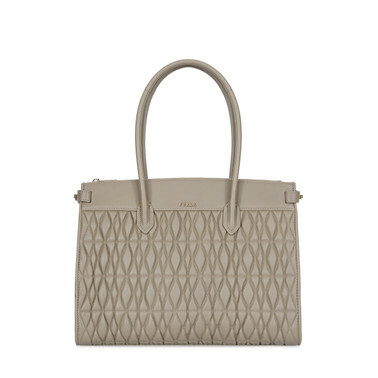 The final touch is given by the fine Furla logo in golden metal on the front. 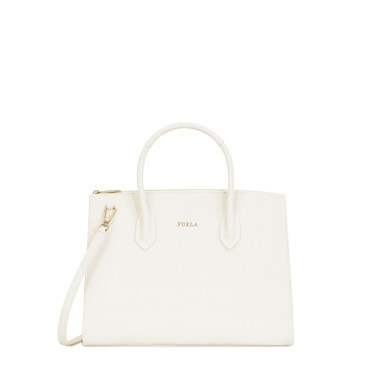 - Adjustable and removable strap. 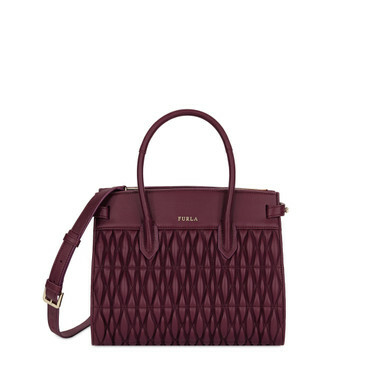 The Furla Pin satchel bag is made of textured leather and comes with a double handle and one adjustable and removable shoulder strap so that it can double up as a shoulder bag and as a handbag. A medium-sized silhouette with two inner pockets that make this bag a functional object throughout the day. The Furla Pin satchel bag in textured leather is fitted with twin handles and a shoulder strap in leather to allow for its usage as a handbag and a shoulder bag. Characterized by its trapeze shape and contrasting-coloured piping, this women's bag features two interior pockets, one of which is zipped. This leather bag boasts a zip closure and frontal lettering in gold-tone metal. Metal feet protect the bottom of this bag from wear and tear.